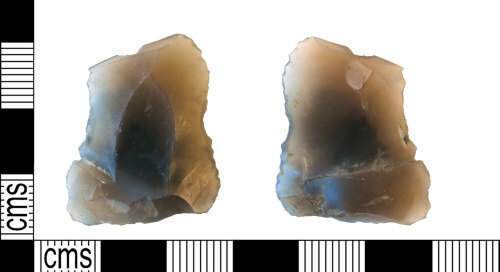 A complete flint Scraper of Mesolithic date (9000-3450 BC). The lithic is sub-rectangular in plan and concavo-convex in section. The dorsal surface has three predominant negative scars, and short, scaled flaking along the proximal edge. The left and right hand edges have semi-abrupt retouch. The proximal and distal ends have been abruptly blunted. The ventral surface is slightly concave due to a single large negative scar situated above a retained bulb of percussion along the proximal end. The flake retains no cortex and is therefore a tertiary flake. The flint is grey in colour with dark grey inclusions throughout. Length: 27.23mm, Width: 23.13mm, Thickness: 6.48mm, Weight: 3.80g.